Pecan pie has long been a holiday favorite with my family. It's one of those desserts I reserve only for the holidays because it is so rich and calorie intense. In my opinion, it is decadence that makes a perfect holiday treat. I've been looking for desserts lately that are easily served in smaller portions after noticing the family prefers bites of goodies rather than whole slices of pies or cakes. Wanting to keep the essence of pecan pie on our menu I thought a pecan square might make a great substitution. 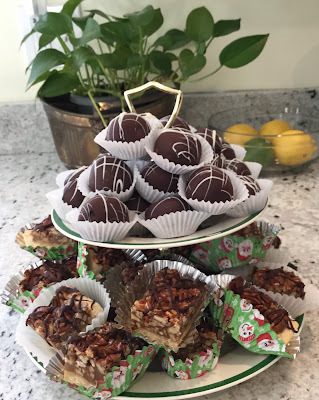 These pecan squares will be a tasty bite for any holiday table. 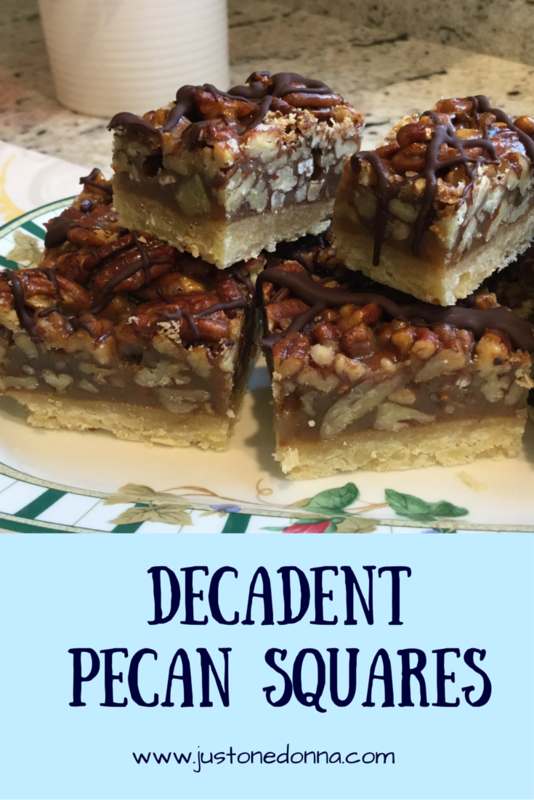 When you first read this pecan square recipe you are apt to be horrified! 2-1/4 cups of butter, 3-3/4 cups of sugar, 2 cups of pecan... The list of ingredients conjures up visions of a heart attack waiting to happen and the recipe is expensive to make. On the other hand, when making these pecan bars for a holiday celebration a little decadence is expected. Plan to bake your squares at least a day in advance of serving. You'll want these squares to fully cool and set before cutting. Chilling overnight in the refrigerator is helpful. Use a rimmed half-sheet pan. Other size pans will not be right for this recipe. The amount of pecan filling is generous. Line your sheet pan completely with foil. Grease the foil. Keep the foil nice and smooth. I had a couple of spots where the foil stuck to the squares, so take your time with this. The foil can be hard to get off. Bake the squares on the center rack of your oven. Cover the bottom rack with foil in case the squares bubble over. It will burn and make a mess that you'll have trouble cleaning up without the foil. If you spread your filling carefully it won't make a mess. Cut your squares into small servings, about 1-1/2" square or 1" x 2" rectangles. Any larger is just too much. Do drizzle the bars with chocolate to make the squares extra special. These squares freeze beautifully so feel free to make them now and serve them later. Preheat your oven to 350 degrees F. Prepare a half sheet pan with aluminum foil, keeping the foil smooth. Grease the foil. To make the crust, beat the butter and granulated sugar together using your electric mixer, until light and fluffy. Beat in the eggs and the vanilla. In a separate bowl, mix the flour, baking powder, and salt together with a whisk. Add the flour mixture to the batter, stirring just to combine. The batter will be sticky. Press the dough evenly onto your sheet pan making an edge around the outside. Bake the crust for 15 minutes, or until the crust is set but not browned. Set aside to cool. To make the topping, melt the butter in a heavy saucepan over low heat. Add the honey and brown sugar, stirring to combine well. Raise the heat to medium high and bring the mixture to a boil. Let the mixture boil for three minutes. Remove the pan from the heat and add the heavy cream and pecans. Immediately, pour the nut mixture over the crust spreading evenly and leaving the edges free of the topping. Bake the squares for 25 to 30 minutes, until the topping appears set. Cool completely before adding the chocolate drizzle. Melt the chocolate and shortening together in a double boiler or your microwave. When using the microwave. Heat the chocolate and shortening for 15-20 seconds at a time, stirring in between. Once the chocolate is melted and smooth, drizzle the chocolate over the squares. Let the chocolate set. Cover with plastic wrap and chill overnight before cutting into squares. Don't be afraid to make these pecan squares. 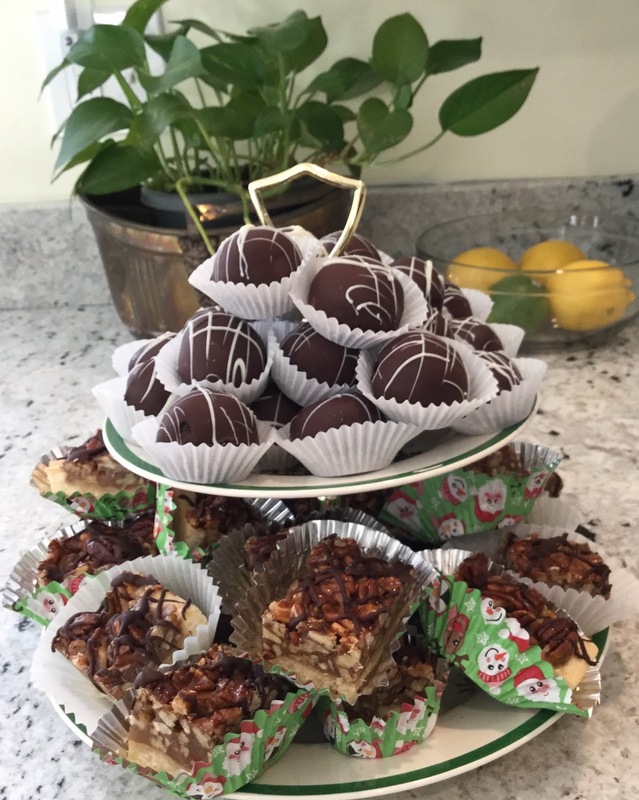 They'll be a welcome addition to your dessert table for holidays or any special occasion throughout the year. Yes please!! These sound like heaven and thanks for all the baking tips! I wonder if this recipe would work in a 9x13 dish with parchment instead of foil? Thanks Donna! Hi, Jenna. No, I wouldn't bake these in a 13x9" pan unless you cut the ingredients. You'll find these to be very generous squares. You'll have more than enough batter for the 13x9" pan if you follow the recipe as stated. Could you use non stick foil and not grease it? Also, what dimensions are in a 1/2 sheet pan? A half sheet pan is typically 18x13x1-1/2 inches in size. I have never used the non-stick foil product, so I don't know about using it in place of the greased, standard aluminum foil. Ooooh! I can taste these already! These look sooo good! I love pecans! 9 sticks of butter in this dish-- can that really be true?? Yes, I warned you that you'd be shocked! Truth is, this recipe makes at least four dozen squares. You could even get away with cutting them smaller than that. 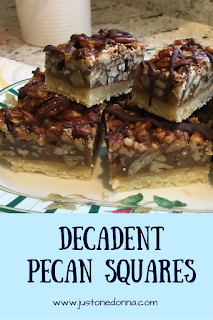 This is a very decadent pecan square. I will only make these as a holiday treat. They freeze beautifully, too. Make a batch now and you'll have plenty for the whole holiday season. These look divine! And yes, sometimes a little decadence is necessary!